The Olympic Koi, Goldfish & Watergarden Club held it’s annual Pond Information Day on July 20,2008. 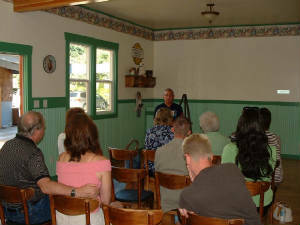 Our members taught sessions on various subjects at the Roadhouse Nursery in Poulsbo, Wash. 11 a.m. to 3 pm. 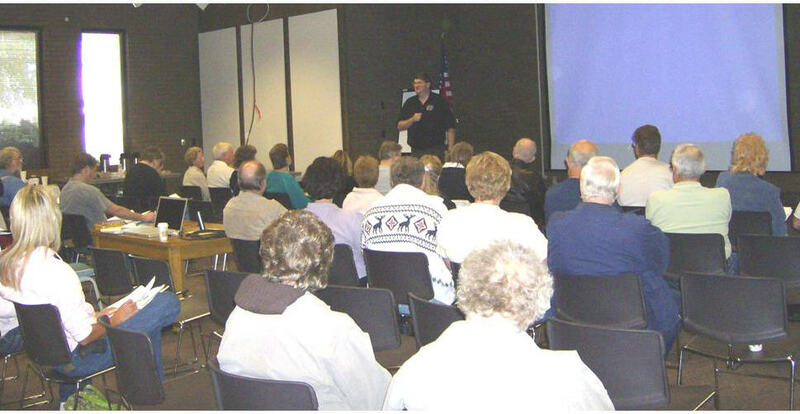 The presentations were free to the public and we were very happy to have about 20 people show up for the day. Refreshments were available for our guests. 1. Think before you dig. 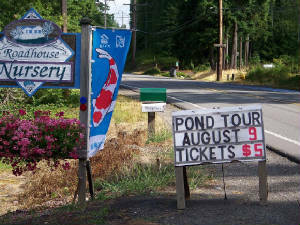 Our club also advertised the fact to the attendees that we were having our 9th Annual Pond Tour scheduled for Saturday, August 8th between 10 a.m. & 5 pm, with tickets available for sale at the Roadhouse Nursery at a cost of $5.00. 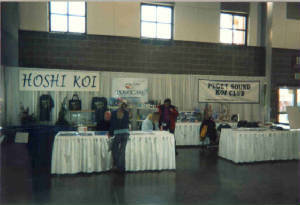 For our 2008 PNKCA grant a booth was prepared to promote membership in the Washington Koi & Water Garden Society. It can be easily set up in various locations. 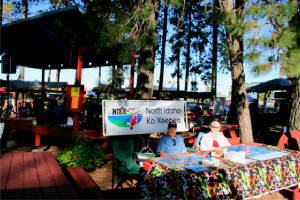 The pictures show the booth at Riverfest, Bothell, WA’s town celebration on August 24th, and at the Russell Watergardens store on September 20th. 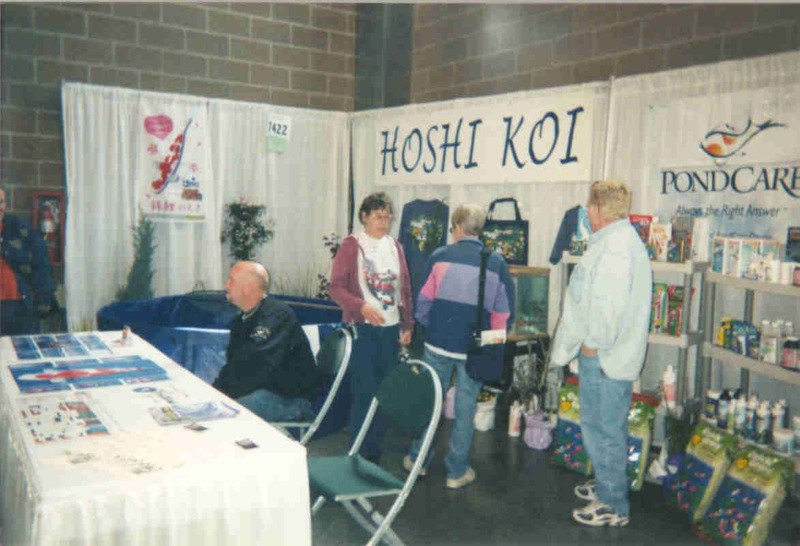 The booth includes information on current year activities, such as the annual koi show, a digital picture player to display club events, photos of member gardens, sample reference books from our library, and membership information. 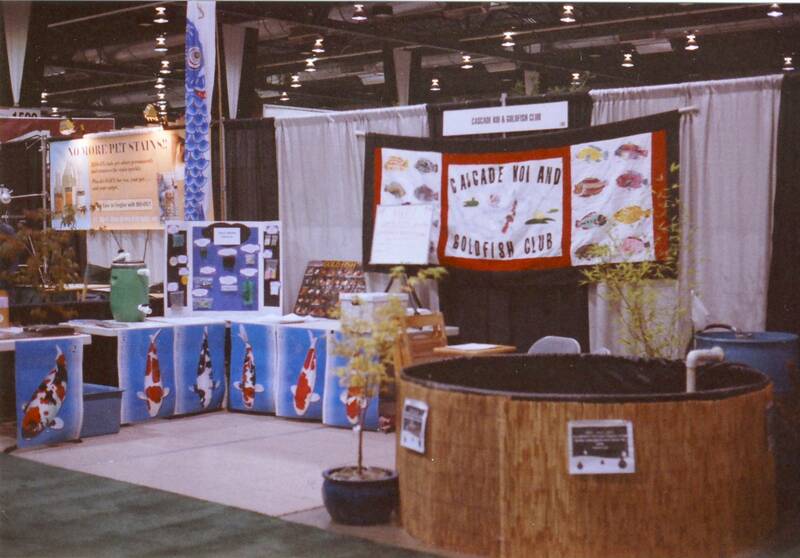 This booth will be continued in future years at other regional koi and gardening centers, and at other events such as farmer markets and town festivals. Our self-guided pond tour started out Saturday morning at 9:00 a.m. We were excited to present 12 unique ponds for the public to come enjoy and learn about koi ponds and water gardening. Our brochures included detailed information about each pond, maps and directions. 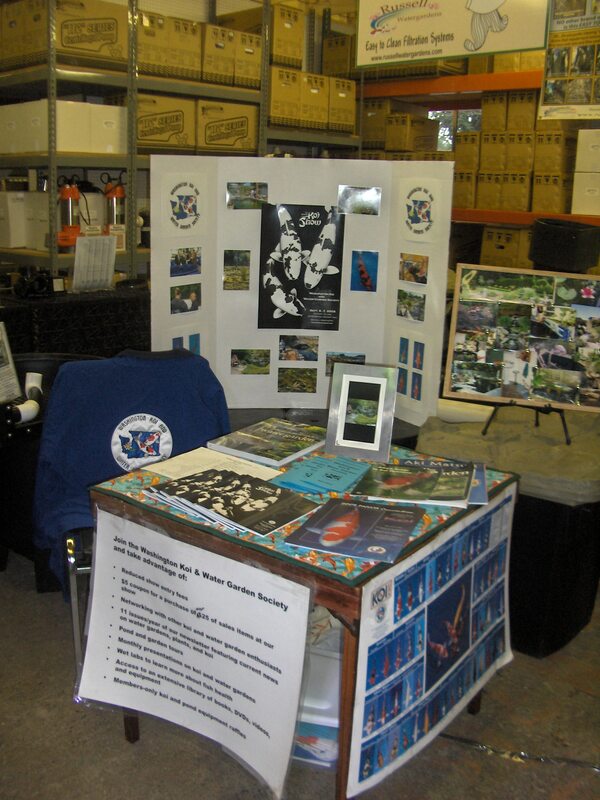 We also included valuable information about the basics of pond and koi keeping, feeding koi, plants in the pond, and the importance of quarantine. 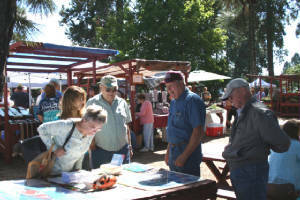 The presentation of a variety of ponds gave the public many opportunities to observe and ask questions of the individual pond owners. Each pond had something a little different to share. We wanted our viewers to have the opportunity to visit as many ponds throughout the day and come away with new ideas for their ponds or be inspired to start up with the hobby. 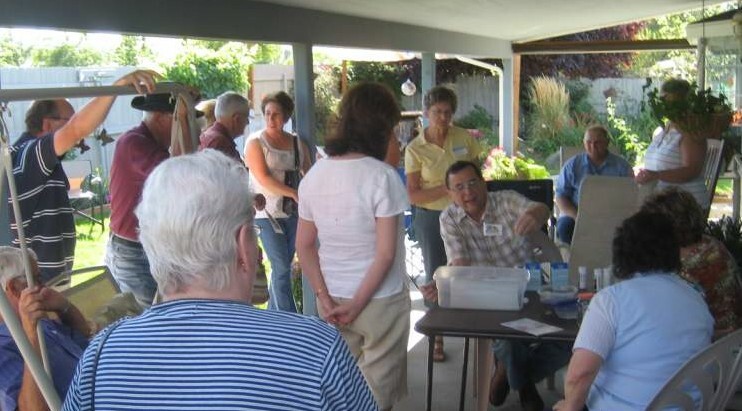 We were very excited to have twelve members of the Siskiyou club come up from Medford to attend the pond tour. Having guests attend that are hobbyists helped provide us with some valuable feedback. Some of the elements from the different ponds that they were most impressed by ranged from seeing a trickle tower at one pond to a homemade multi-chamber filter at another. Several of the ponds are close to the river; one pond owner was able to show how their suspended netting system keeps the heron and osprey out of their pond. The filtration systems were unique to each pond from Nexus filters to a homemade sand filter to a stream and bog system. Our club members are very talented and creative when it comes to their pond and gardens. We would like to thank our club’s program director, Bill Harper, for all the work he did to get this pond tour organized. Thank you to the following pond owners for opening up their pond for the day: Bill & Mary Harper, Neil & Diane Thompson, Lonnie & Dixie Harris, Dave & Robin Lugar, Matt & Tracy Flury, Melton & Darcy Hefner, Dale & Maggie Roark, Norman Call, Velda Traylor & Rick Richtik, Randy & Kim Brock, Wintergreen Nursery, and Elsie Richardson. After a day of sharing our ponds we enjoyed potluck social at the home of Elsie Richardson. Opening up our ponds and gardens gave us a chance to share information about the things that work and some of the mistakes we have made and learned from. Hopefully, we gave those people that attended some information that will help them with their ponds and gardens. Club president Ron B explains his findings on a member's pond water. Before the water testing, Ron gave a presentation how organics affect water quality in a pond. 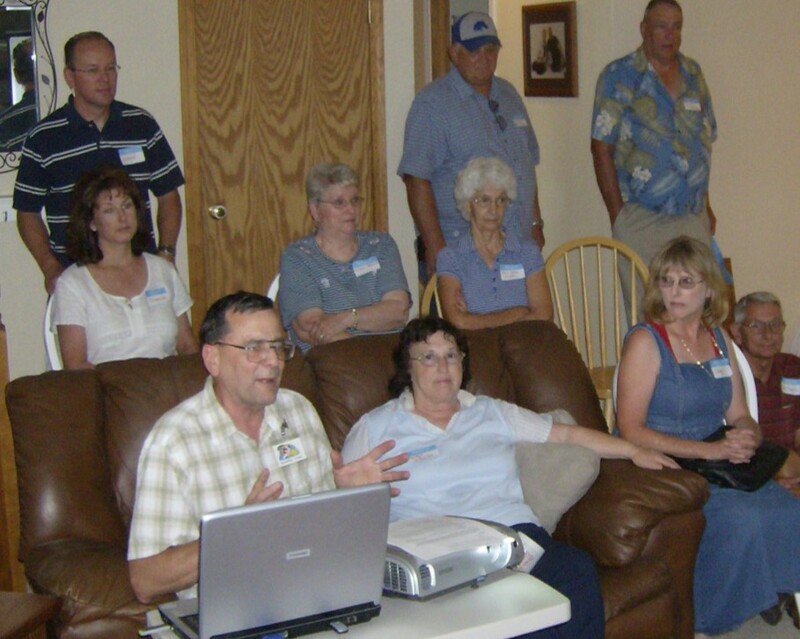 A capacity crowd gathered at Rod and Eileen Thorne’s home on Sept. 6 for a combined Recreational Meeting and Water Quality Seminar. 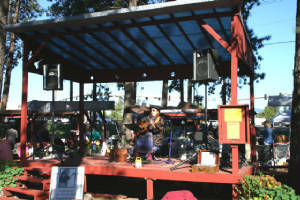 The event was published in the newspaper and the public was invited. 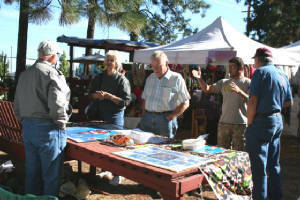 Club members welcomed about a dozen or so first-time visitors who responded to the invitation. People were encouraged to bring a sample of their pond and house water. Those who did had their pond water tested for Ph, nitrites, Kh/Gh and ammonia. The house water was tested to see how closely aligned it was with the pond water in Ph and Kh/Gh. About 30 people attended the event and at least half of them brought water samples to test. Before the water tests began, Ron Boedeker gave a power point presentation on how organics affect a pond’s water quality. Then it was out back to the patio where participants eagerly waited for a turn to have their water tested. Some interesting things revealed in the tests was the difference in the Kh/Gh levels within the Richland, Pasco and Kennewick cities—with the Kh/Gh readings much lower in Pasco. While most of the club members had been to the Thorne’s before, the visitors were very interested in their pond and kept Rod busy answering questions on its filtration, plants, fish and the pond’s construction. The visitors had lots of questions on the club and its function and seemed appreciative of the information they got. April 19th and 20th were the days we had involvement in Japan Week and it was fantastic fun! We started by setting up a show tank at RiverPark Square at 8:00 a.m. Colleen McCalip, John Seifert, my son, Quenton, and my niece, Adrianna, helped bring in and set up equipment and start filling the show tank. 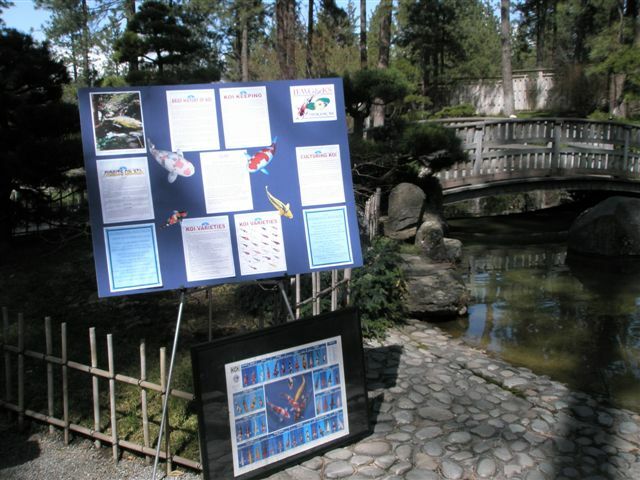 We had one table with information sheets and a display of information on koi, including the development of koi in Japan. We had a separate table where we had coloring sheets with the outline of a koi on one side and "fun facts" on the other and crayons available. Blue Iris provided the five koi for the show tank and Gino brought them in promptly at 9:00 a.m. We were up and ready to go! Over 400 of the yellow information sheets and 390 of the coloring sheets of Koi were made. By the time we were done we had 120 yellow sheets and 90 coloring sheets. Jim Elms came down and sat at the booth for a couple of hours handing out information sheets. 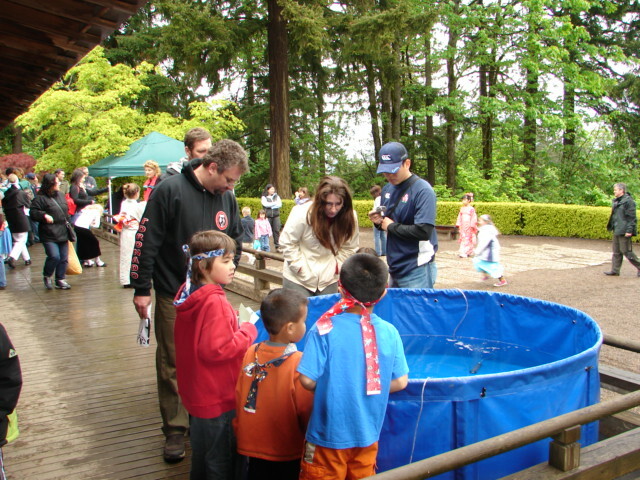 We had a tremendous amount of interest in both the koi and the coloring sheets! It was fun to watch the children make up their own design or copy a koi from the Koi Chart showing varieties of koi. They did an amazing job...hey, even Colleen and I got in the act and colored a few! Frank came down in the evening and helped out right up until we started tearing down at 9:00 p.m. that night. Kathy Thompson of Blue Iris came and got the koi that were loaned. Thanks Kathy and Gino for your help in making this even a success! In the evening there were many teenagers that came by. One mentioned having a history project that was on Japan...so he took the yellow sheet and koi facts and was going to do the report on koi and the development of koi by Japan! So, then we had more teenagers come and ask for the same information so they could do their reports! On Sunday, Adrianna and I set up the booth at the Japanese Gardens at 1:00 p.m. and were there until about 3:30 p.m. and Frank came and helped us tear down. It was amazingly sunny during the Garden Festival portion, even if it was cold! 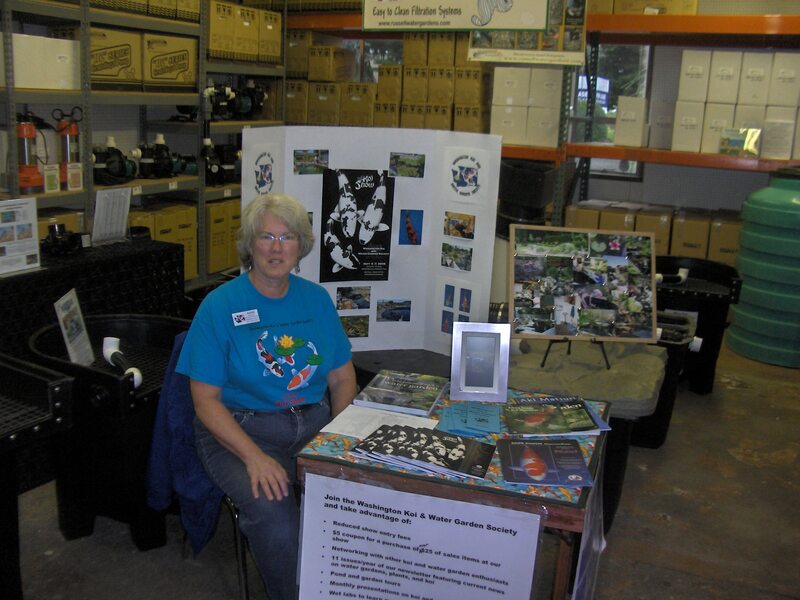 Claudia McGowen, who has been part of the pond cleanup and koi health there for many years, came and spent a couple of hours discussing the health of the koi and what has been done by our club in the past in the way of clean up and koi health. 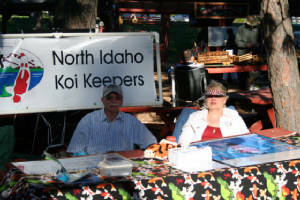 The many people who were there were truly educated in how to help take care of the koi and learned more about koi! We had one (dare I say it) minor glitch. Nordstrom's was not told we would be using their sink to drain out our show tank in the evening. Evidently Nordstrom's owns the building and land and are not part of RiverPark Square management. So, when our tank took longer to drain than expected (I brought a pump that was supposed to be 950 gal. per hr., it was probably less that 100!) The manager was antsy and wanted to leave - after all, she had done her shift. We tried to find an alternative place to drain the tank. One guard said we could use the front door....then another guard (after we had taken the hose from Nordstrom's and out the door) said no! A back room in a hallway was found that the hose was taken to and it worked out okay, even if it was slow! I did try to take a dip! As the hose was being dragged to the back room it caught a part of the side of the show tank which started to collapse. As water started to gush out I tried to catch the side and the pump at the same time...didn't work. I went down and most of the water went right into my lap as I fell on the dang floor! You know how it is if you drop a cup of water on the floor - it spreads! (The maintenance girl came and it was mopped up very quickly and the mall people were very nice about the whole situation.). However, after all that none of us (Colleen McCallip stayed the entire day right to the very end!) got out of there before 10:50 p.m. Next time (if allowed) we would bring the big daddy of a pump so it would only take about 20 min. to empty. My favorite part was the little boy that came running up to me in the Nishinomiya Tsutakawa Memorial Gardens (Japanese Gardens at Manito Park) yelling out "Yesterday I was at the Mall and I saw a SHOWA!" He had evidently been down at the mall and had been taught what types of koi we had in the show tank...he remembered the showa! He was adorable (about 5 years of age). So, since one of our goals is to educate people we really was able to fulfill that goal in an outstanding way. I was proud to be part of this event and hope this club makes it an annual event! 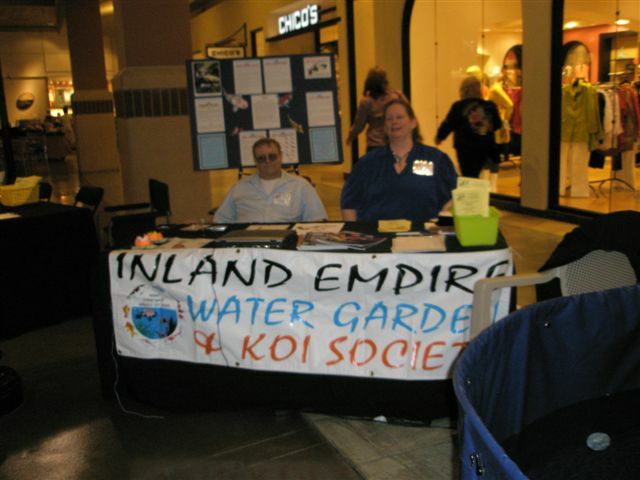 The first time our club ventured into the community to share information about ponds and Koi was April 26-27, 2008 at our local Master Gardener’s Spring Fair. From the pictures it looks like everything began on the day of the fair but in reality that day was preceded by months of talk and planning. 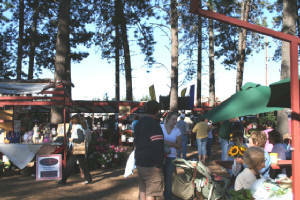 Since our club does not presently own any equipment we are fortunate to have a good relationship with the In Thee Garden branch of Southern Oregon Nursery. This store is our best local resource for pond building equipment and all pond and fish supplies. 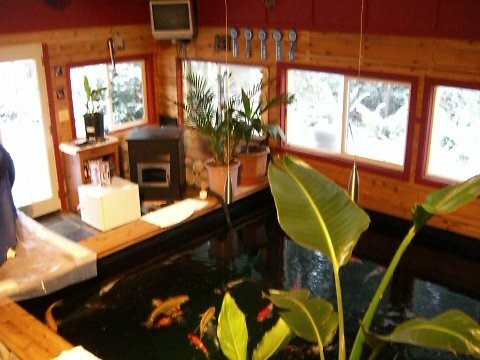 They offered to loan us a large 400 gallon tank, a pump, waterfall filter and all the necessary things to make it work. They also offered us a spot in their booth. Dennis, the owner, is a member of the club. On Friday we cleaned the tank and got everything ready to go. Our coach for this first outing with Koi was Elsie Richardson, from Roseburg. We prepared the water on Friday as per her instruction by adding our cup of salt and de-chlorinating the water. Very early on Saturday Elsie came to show Dan and Lois the proper way to catch and bag very large Koi (any Koi for that matter). Elsie generously loaned us her nets and bowls as we didn’t have access to anything that large. Dan got in the water and with net guidance from Dieter of Southern Oregon Nursery we actually got one in the bowl. They lifted the bowl out of the water and slide the fish into a bag. The bagging was properly completed and the fish was boxed for its trip. After the first one we were feeling more confident and got choosey on which ones to take. When we got to the fair, Elsie showed us how to get them into the Koi sock net and then into the tank with no mix of water. Slick! We are going to have to start saving for some equipment of our own. With the fish happily swimming we were back in our comfort zone, talking to people about how we love our ponds and fish. We were eager to share how much we love hand feeding and learning the different personalities of our Koi pets. We got lots of questions too. We heard the word “heron” many times during the day, answered many questions on how to get rid of algae, and a variety of other pond topics. We also told people about our club. One person filled out an application and joined on the spot. The new brochure was a big help and we also had a flyer about our next meeting. Our new banner and club shirts helped us feel proud of our club and our progress in just one year. The fish water was tested for ammonia on the schedule Elsie gave us and we were pleased to find the level zero. Saturday night we covered the tank to make sure they stayed inside. Sunday at the fair was pretty much a repeat of Saturday, lots of talk and questions. When the Fair was over we bagged the Koi and took them back where we got them. We were happy to have them returned safe and sound. This was a great experience, one that will probably become a tradition as it is a logical place to meet people who would likely be most interested. We are very grateful to Elsie for her help and support. We learned a lot and will feel confident to do it again on our own. Dennis gets a big thank you for his support which was essential this first year. We also appreciate the involvement of so many club members. The people who worked at least one two hour shift in the booth are Dan, Christian, Linda, Ron, Sandi, Wendy, Jewel, Leanne, Charlie, and Lois.